All of South Australia could be without power until the early hours of tomorrow morning after a network failure. Paul Roberts from SA Power Networks said the authority was investigating the issue. "We're obviously still trying to find … out [what happened] but what has happened is that the whole state has been blacked out," he said. "That's due to some upstream issue with the transmission network, we're not receiving any supply through the transmission network. "We believe — and this is only early information — that there may have been some issue with the interconnector but the state's power system is shut down I think possibly as a protection. Premier Jay Weatherill tweeted about the outrage and said it maybe "for an extended period". SA Police said just after 4:00pm most intersections in Adelaide were without traffic lights and urged drivers to drive carefully ahead of peak hour. The warning said winds of 140kph could occur in Whyalla, Clare, Maitland, Hawker and Leigh Creek, while winds of 90-100kph are forecast for Adelaide and Mount Lofty Ranges. The SES has tweeted and asked people to stay at home. Funny how the developed world panics the instant the lights go out. We've already had two outages here today. I rather think you meant to say " developing world ". Why? S.A. is as developed as anywhere. People are going to have to do without their phones once they run out of power. No power throughout the whole state ? No refrigeration , trains , radio , tv , can't charge the phone or use landlines. It's still cold enuff down there this time of year to keep their excellent wine choices cool I guess. Losts of new borns 9 months from now , fkall else to do. This power break in Australia is caused by natural causes disrupting a first class world. Load shedding or power cuts in third world countries are man made. 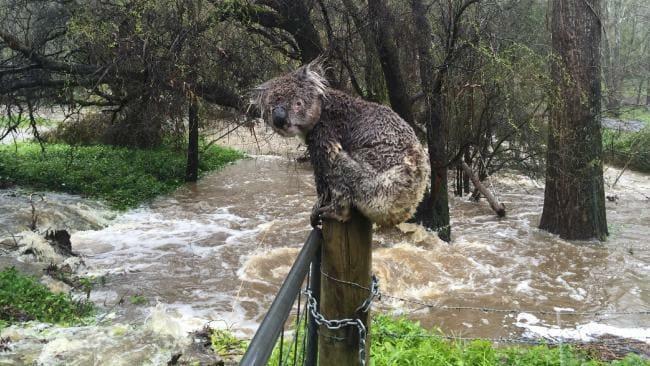 Russell Latter captured this photograph of a wet koala as it perched itself on top of a fence post during floods in South Australia.